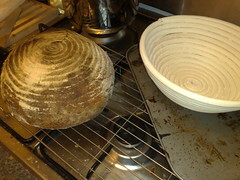 So, one of the things I’ve been doing instead of cleaning during the dark winter days is experimenting with sourdough. This is a way of leavening bread without using baker’s yeast, and involves quite a lot of mucking around and takes an extraordinary amount of time to make each loaf. On the plus side, although you can buy all sorts of expensive equipment to help you with sourdough baking, there’s no need to do so. You can make everything you need with just flour and water, and a baking tray. Instead of packet yeast, you make an icky mix of flour and water that takes natural yeasts and bacteria (the good kind) out of the air and flour. The flour and water mix needs feeding every day with more flour and water until it gets going, and then can be put in the fridge and fed only weekly. When you’re ready to use it, you pour the whole starter out into a bowl in the warm and feed it again. Leave it in a bowl until it froths, while you try and clean the manky jar it lives in most of the time. Use most of the bowlful (called a “sponge”) to make the actual bread and reserve some of it to back in the jar in the fridge for the next loaf. The natural yeasts are not as quick as commercial bakers yeast, so it can take the best part of two days to prepare the sponge and prove the dough before cooking. All this I have learned, mostly from S John Ross’s very down to earth, nice and simple page. I’ve also been dipping my feet into the Sourdough Companion but they are serious bread nerds and even their beginner’s guide is pretty heavy going. 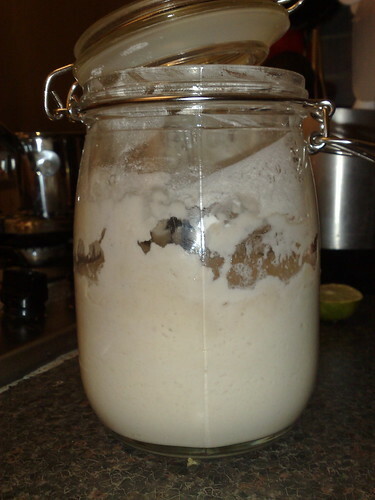 My starter is still quite young, and so I’ve not yet been able to make a full sourdough loaf. When you feed the starter you’re supposed to discard half of it, but yesterday, I used the discarded bit to make a half-n-half sourdough / baker’s yeast loaf. This is a hybrid of S John Ross’s basic recipe and some of the dough training recipes from Sourdough Companion. Bring the mix together to a soft dough with a wooden spoon and then do a few initial stretches by hand to help form it. Stretch and fold a third over from the back and third over from the front before turning 90 degrees and flipping over to repeat. Although you’re supposed to stretch and knead bread on an oiled flat surface, I’ve always down this in one large plastic bowl, which helps prevent the flour from getting everywhere. Let the dough have its first proof in the same bowl, for an hour or so in a cool room, until the dough has grown. Unfortunately the superhuman packet yeast just kept going through the cold, and by morning it had risen to fill the banneton. Oh, yeah, bannetons. You don’t have to buy anything to do sourdough, but a banneton is the one thing I did buy. It’s a pretty patterned shaped container you put the bread in for its final proving. It supports the dough, and the pretty shapes imprint the top of the loaf so that the final loaf looks nice. I bought mine here after Christmas, and it was in the post within a day. You flour the banneton so the dough doesn’t stick to it. Make sure you turn it out and don’t try and cook in the banneton! So this morning, all I had to do was bake the loaf. Time and temperature was the key difference between John Ross and Sourdough Companion. Ross says 170 deg c for 35 mins, without pre-heating the oven. SC says preheat the oven to 210 deg c for at least an hour and then cook for 45 mins. So I fudged it. I set the oven the 200 deg and let it start warming. After about 5 mins, but before it got to temperature, I put the bread in on a baking tray lined with parchment. And the loaf was ready long before the timer sounded – something 25 mins. You can tell when it’s ready because you get a hollow sound when you bang the bottom with a wooden spoon. 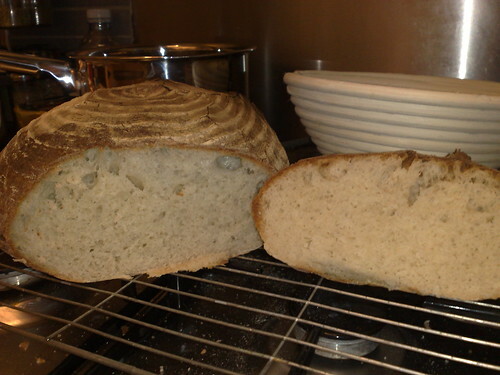 Allow to cool before cutting and you can check to see the state of the “crumb” (the bit that isn’t the crust). Are there good size uniform air pockets? Does it look right? How far through does the crust go? Is it all cooked? This looks OK and tastes OK, was easy to cut and not too heavy. I’ll try something similar for Monday morning, and hopefully soon, the starter will be ready to make bread on its own without the addition of the packet yeast. Oh – one final thing – I want to try and use this crust topping to make tiger bread that’s suddenly all over the supermarkets.